First Some Kind of Monster, then Anvil! The Story of Anvil and now it's Maynard James Keenan's time to have the doc cameras turned on him in the most shocking rock and roll sexcapade of the year, Blood Into Wine: The Arizona Stronghold. Well, not really. 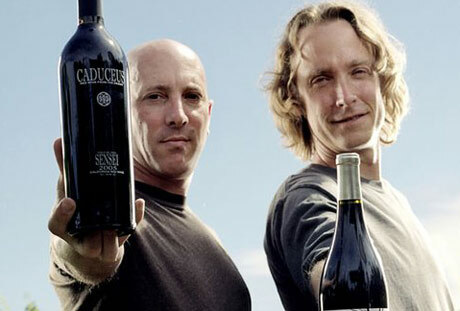 The flick is actually about the wine business Caduceus Cellars, which Keenan - of Tool, Puscifer and A Perfect Circle fame - founded with Eric Glomski, his business partner. Filming for the doc, which is being directed by Ryan Page and Christopher Pomerenke (Moog, The Heart Is a Drum Machine), will finish in September with a slated theatrical release date of February and March 2010, with a soundtrack featuring original music by Keenan to accompany the release. There's already a trailer for Blood Into Wine, which is down there below. On the more musical front, Tool also have several live dates lined up, including one in Toronto on August 5.